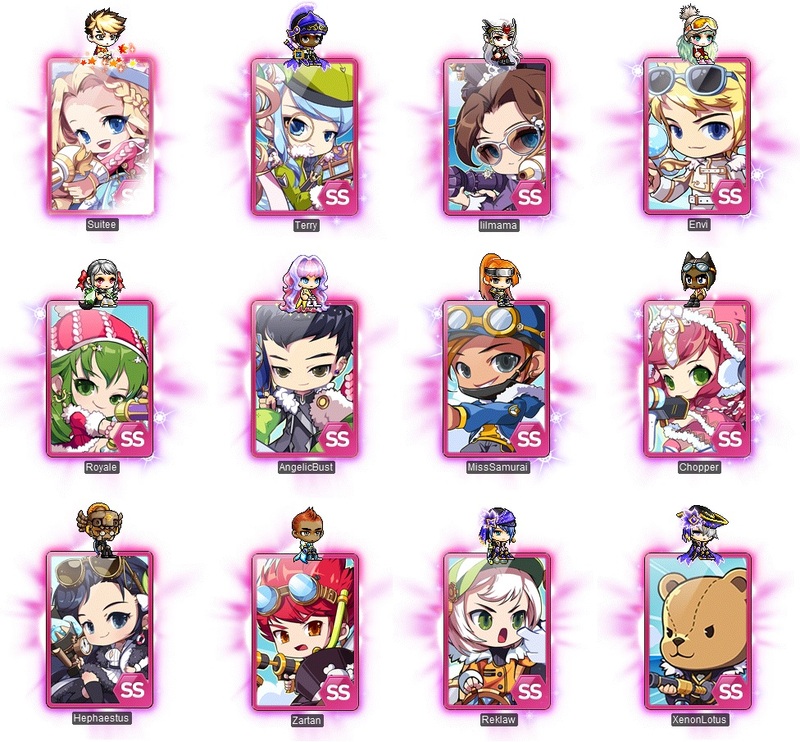 Holiday Events: December 13 – January 2 | Dexless, Maplestory Guides and More! The holidays have come to Maple World! We're hosting a bunch of joyous seasonal activities for you to enjoy. Visit Snowdrift Lodge and Happyville, decorate a Christmas tree, receive special gifts, and more! Escape from the chilly winter weather by visiting a tropical island in the Winter Retreat event! Players Lv. 33 and above can begin by speaking to NPC Kemdi or selecting the quest ‘[Nova] The Secret of the Remote Island’ from the star event notifier on the left side of the screen. When you’re ready to go, NPC Kemdi will move you to the island. Join the battle and throw water droplets at other players to earn points! Use the WASD keys to move and the mouse left-click to throw water droplets. You can also use the spacebar to roll around the map quickly using the Rolling skill. Look out for trees and other objects within the map that you can destroy to gain skills and EXP. You also earn EXP from defeating other players. Red Potion: Fully recover HP instantly. 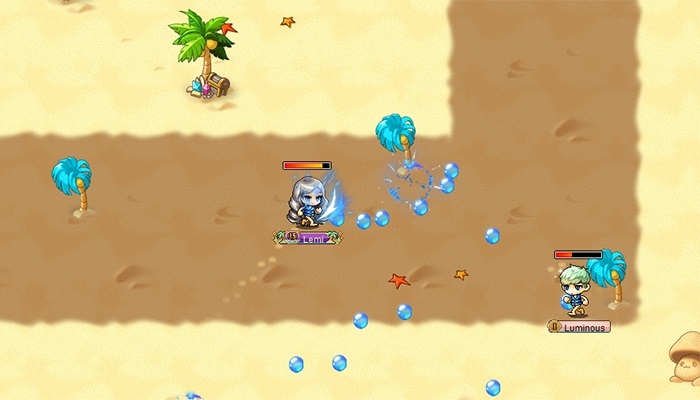 Whizzing Waterdrops: After casting, it increases basic attack and launch/firing speed and attack range for 15 seconds. Water Sprinkler: After casting, the basic attack is divided into five and fired for 5 seconds. Attack range is decreased. 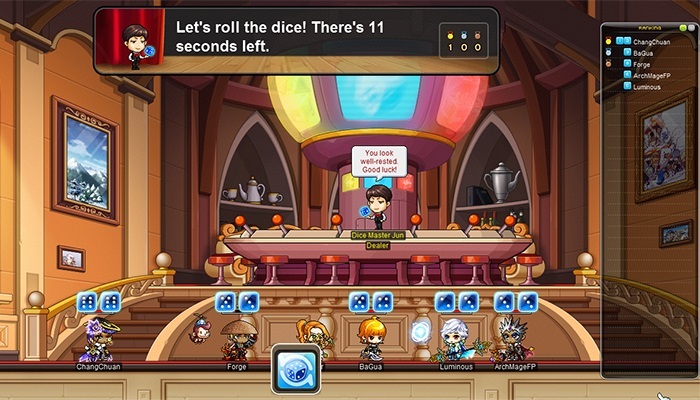 Rolling Reboot: After casting, your Roll skill can be used up to 5 times with no cooldown. As you earn EXP, it converts to points that you can use to get rewards! Speak to NPC Kemdi in the waiting area to exchange your points for rewards. He’s got some great items, including special chairs. 2X EXP Coupon (15 min): Untradeable. 1-day duration. Mystery Card Pack: Untradeable. Expires January 2, 2018 3:59 PM. Complete achievements related to the event to receive even more rewards! 2X EXP Coupon (15 min) (x3): Untradeable. 7-day duration. Nova Coin (x30 – x100): Untradeable. Palm Frond Damage Skin Coupon: Untradeable. 7-day duration. Grants a permanent damage skin. Tree Label Ring Coupon: Untradeable. 7-day duration. Grants a 30-day ring. Tree Chat Ring Coupon: Untradeable. 7-day duration. Grants a 30-day ring. Winter Retreat Detective: Medal. Untradeable. Collect different photo cards during the event to earn rewards! Characters Lv. 33 and above can begin by accepting the quest ‘[Nova] Collect Winter Photo Cards!’. Hunt monsters within your level range (20 levels below and 20 levels above) to obtain Mystery Card Packs. Open a Mystery Card Pack to receive one random winter photo card. There are twelve different cards, and each card can one of four ranks (B, A, S, SS). Cards have different effects. You can save the effect by equipping the card in the deck of the Winter Photo Card UI and turning on the effect. Cygnus Card: Increases Boss Monster damage. Neinheart Card: Increases Buff Duration. Claudine Card: Increases Critical Rate. Mihile Card: Increases Critical Damage. Irena Card: Increases damage against regular monsters. Eckhart Card: Obtain additional coin from the Nova Box. Hawkeye Card: Gain guild contribution when hunting monsters. Oz Card: Increases Weapon ATT/Magic ATT. Blaster Card: Bonus Honor EXP is distributed when using Medal of Honor. Battle Mage Card: Increases STR/DEX/INT/LUK and MaxHP/MaxMP. Wild Hunter Card: Gives a chance for a bonus Monster Collection capture. Checky Card: Gives Profession Mastery. You can use fusion to combine multiple B-, A-, or S-rank cards, and obtain one card of a higher rank. There’s an 80% success rate when fusing B- and A-rank cards, but fusing S-rank cards has a 100% success rate. 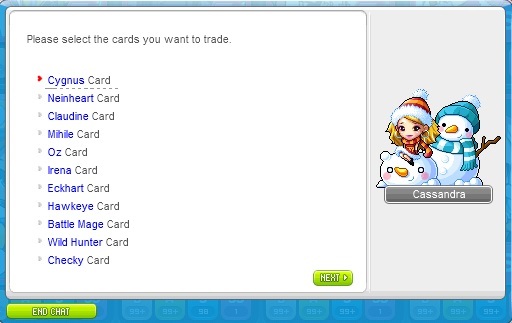 You can also trade in multiple B-, A-, or S-rank cards, and receive a B-rank card of your choice. 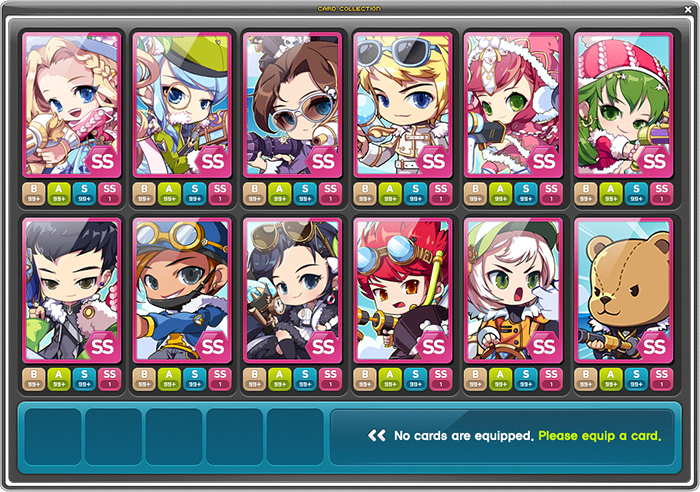 On Sundays (December 17 and December 31) you can log in to the Sunny Sunday event and obtain a Magical Card Pack. Open the Magical Card Pack to receive an S-rank card of your choice. You can only receive one Magical Card Pack per account per Sunday. Open lots of Mystery Card Packs each day to receive Nova Coins! You can also complete relevant achievements to earn more rewards. You’ll receive Nova Coins and a special chair. What are the holidays without gifts? Hunt monsters within your level range (20 levels below and 20 levels above) for the chance to obtain a Shining Santa Box. Open the box to find items such as Nova Coins, Rudolph’s Red Nose face accessory, winter buffs, Gingerbread Cookies, or a 7-day Santa Sled Mount coupon! Someone's been nice this year! Visit Snowdrift Lodge, where you can take part in festive mini-games! Players Lv. 33 and above can begin by accepting the quest ‘[Snowdrift Lodge] Snowdrift Lodge Grand Opening’ from the star event notifier on the left side of the screen. Select ‘[Snowdrift Lodge] Lodgeward, Ho!’ to move to the event map. 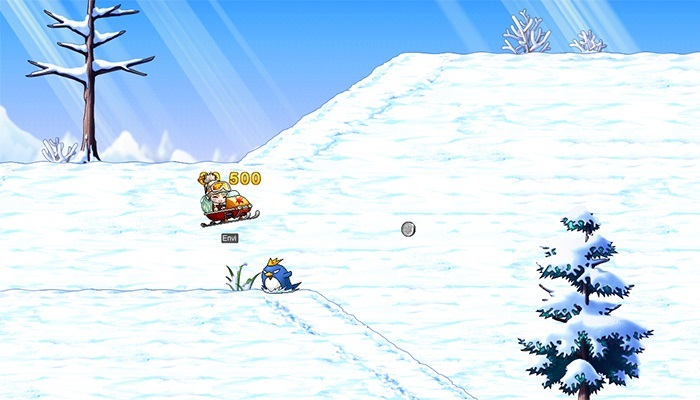 Silver Mountain Slopes: Ride a snowmobile down the mountain and avoid obstacles to receive mesos and EXP. 30-Player Dice Game: Accept the invitation at the 30-minute mark between 12:00 AM and 11:59 PM (UTC) to play a game of dice against other players and receive Snowdrift Lodge Coins. You cannot accept the invitation from all maps, so it would be best to wait in town around the time the event will begin. Snowdrift Lodge Coin Shop: Exchange Snowdrift Lodge Coins for a chair, mount, EXP coupons, and more. 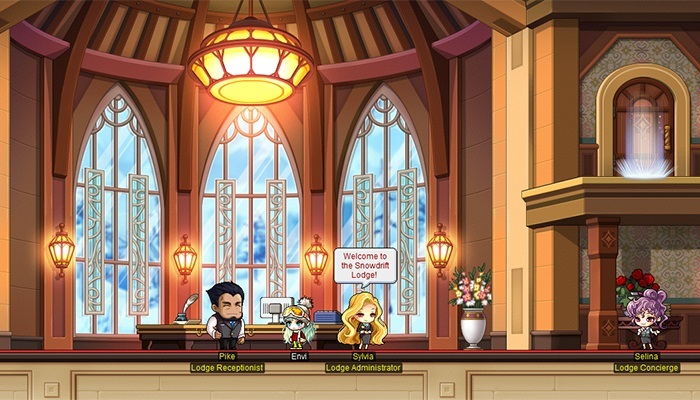 Snowdrift Lodge Suites: Visit one of four suites and stay logged in at the inn to earn EXP and a different Trait each day. You need a Snowdrift Lodge Room Key from the coin shop to access a suite. Complete quests at the resort to earn Snowdrift Lodge Coins. The coin shop is stocked full of items including a 3x EXP Coupon, Potential scrolls and stamps, Mastery Books, Ten-chair Bag, Snowmobile Mount, Wooden Hot Tub Chair, and Chilly Ice Damage Skin. Use the Snowdrift Lodge Suite 5 times to receive the Snowdrift Lodge VIP: Medal. Req. Lv: 33, STR/DEX/INT/LUK +5, Weapon ATT/Magic ATT +5, MaxHP/MaxMP + 1000. Everyone needs a gift at Christmas! Accept the quest ‘[Christmas] Christmas Means Presents’ from the star event notifier on the left side of the screen to receive a Christmas Gift Box. Open your present to receive the following items! Christmas Wreath Label Ring Coupon: Untradeable, 7-day duration. Use the coupon to receive a 30-day ring. Christmas Wreath Chat Ring Coupon: Untradeable, 7-day duration. Use the coupon to receive a 30-day ring. Christmas Costume Coupon: Untradeable, 7-day duration. Use the coupon to select either the Santa Package (will be given based on character’s gender) or Rudolph Package. Santa Package: Untradeable. Use to obtain a 7-day costume. Rudolph Package: Untradeable. Use to obtain a 7-day costume. Part of the holiday fun is decorating a Christmas tree! Join the festivities by accepting the quest ‘[Christmas] Deck the Trees’ from the star event notifier on the left side of the screen. 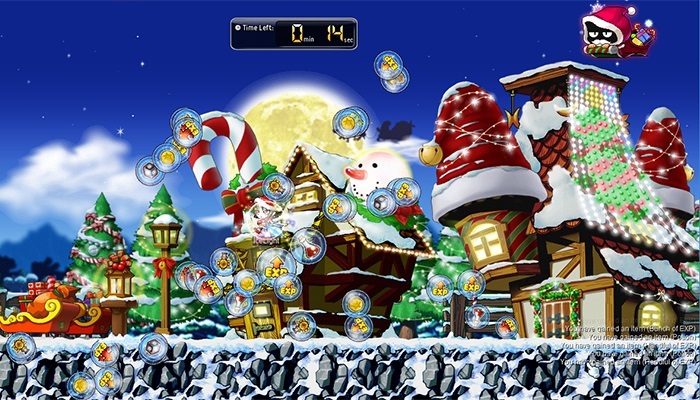 Hunt monsters within your level range (20 levels below and 20 levels above) to collect decorations including Shimmering Stars, Flashy Ornaments, and Soft Snow. You can exchange these for four different ornaments (Star, Snow, Tree Bell, and Ribbon). 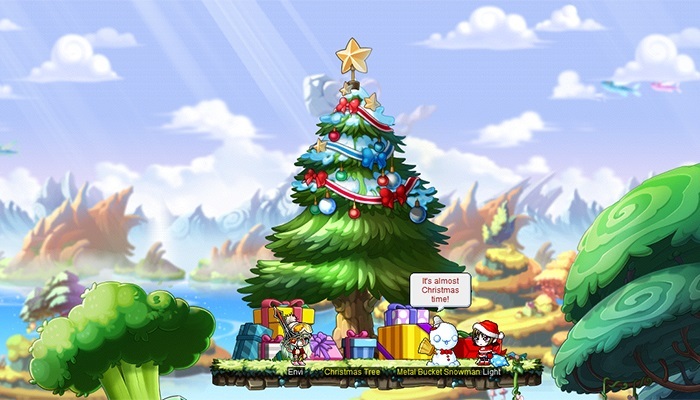 Visit Henesys, Leafre, Haven, or Chu Chu Village and click on the Christmas tree in town to decorate it! Once you successfully hang 15 ornaments on the tree, you’ll receive Nova Coin (x50). It’s not the holidays without Happyville! Once every hour, an invitation will appear about your character’s head, ready to whisk you away to the land of Christmas, Happyville. Players Lv. 33 and above can visit Happyville two times per day. When you arrive, you’ll find Santa flying through the sky, dropping presents for everyone. He only appears for 30 seconds, so be ready to catch a gift! Santa’s bag is stocked with Nova Coins, restorative items, EXP, mesos, Occult Cubes, and Medals of Honor (regular, basic, and intermediate).